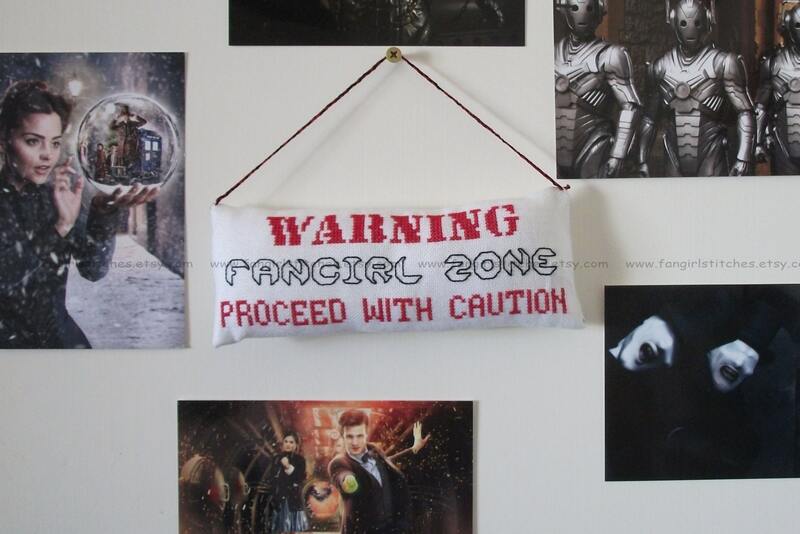 Promote your inner Fangirl / Fanboy with this padded door hanging. 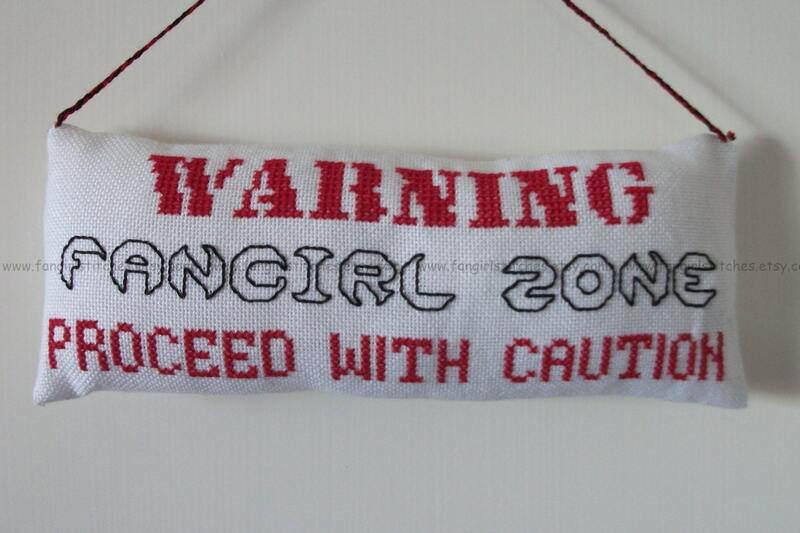 Includes two cross stitch patterns - Fangirl and Fanboy. This design includes full stitch and backstitch, and is suitable for beginner stitchers. The pattern comes with a colour chart, including a guide for starting and finishing your project. The main floss key is in DMC, although of course you can adapt it to suit your preferred brand of thread, or those left-over threads you have on hand. Please note - this listing is for a PDF version of the pattern only. The pattern will be delivered to you instantly once your payment has been confirmed. The download link will also be available in your purchases folder. Due to the nature of digital files, no refunds can be given. The pattern can be printed, or used on a computer or tablet device. You will need a PDF viewer to access the file. If you don't have one, AdobeReader can be downloaded free from http://www.adobe.com/products/reader. PDF readers or viewers can also be downloaded as apps onto tablet devices. Thanks for looking, and if you have any questions about this or any of my other listings, please let me know. Patterns are for personal use only. Finished projects can be given as gifts but not sold for profit. To fulfil your order, you must provide us with certain information (which you authorised Etsy to provide to us), such as your name, email address, postal address, payment information, and the details of the product that you’re ordering. You may also choose to provide us with additional personal information (for a customised cross stitch pattern or kit, for example), if you contact us directly. •	Compliance with laws. We may collect, use, retain, and share your information if we have a good faith/belief that it is reasonably necessary to: (a) respond to legal process or to government requests; (b) enforce our agreements, terms and policies; (c) prevent, investigate, and address fraud and other illegal activity, security, or technical issues; or (d) protect the rights, property, and safety of our customers, or others. •	Change, restrict, delete. You may also have rights to change, restrict my use of, or delete your personal information. Absent exceptional circumstances (like where we am required to store data for legal reasons) we will generally delete your personal information upon request. Patterns are able to be personalised to suit your individual preferences - such as character changes for alphabets, additional writing, or insertion of names into the wedding or birth samplers. A fee is charged on all personalisations due to the work involved - this fee is dependent on the specific customisation involved. Yes, you can order a customised cross stitch pattern! Send me a message detailing what you are after and I can give you an idea of the price - this can depend on the size of the pattern and the time taken to research and edit the pattern. Is this listing for a finished/stitched piece? No, all of my listings are for cross stitch patterns or kits - you are emailed the pattern (or sent the kit) so that at you can then stitch your own piece (again and again if you wish!). Customised/personalised orders are only accepted for cross stitch patterns. Due to the time taken to stitch the finished pieces, unfortunately I am not able to accept orders to stitch the pattern for you. Unless otherwise stated, the cross stitch patterns are designed to be stitched on 14 count aida or 28 count evenweave. Where a piece has been designed for a higher count fabric, this will be included in the item description and title to make it easier for you to but your fabric in advance. outstanding service, fantastic chart. excellent quality.